Anyone remember this song? Or is just me? 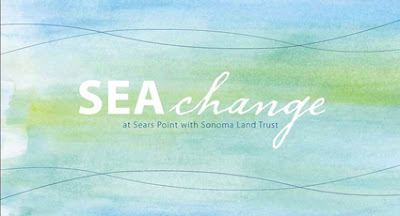 Tomorrow (Sunday, 10/25) we're going to see a levee break at Sear's Point in Sonoma. They're expecting 1000 people to attend, so we're not going to coordinate an official Outside Kids meet up like we usually do. Go when you can, and we'll see you somewhere there. We ask that you please plan to arrive anytime between 2pm and 5:30pm--please no earlier and no later. Please note: the levee will already have been breached earlier in the day, so there is no need to arrive at the very beginning of this time frame--the waters will be flowing through the levee and throughout the entire site all day. You may want to consider arriving sometime in the later afternoon to avoid the initial rush of traffic. Once onsite, you will have the opportunity to walk the trails on your own, and talk to the various interpreters and birders along the way to ask questions and learn more about the project and wildlife. There are two main trails to take: the mile-long walk out to the viewing platform at the breach site and the 2.5-mile long future extension of the Bay Trail. This afternoon will be the only opportunity to get up close to the breach site--in the future the trail will end a ways before that site. It will take about an hour to walk to the levee breach site and back. The Bay Trail extension heads away from the breach site and you can walk however far along it you wish and observe the extent of the reach of the new sea waters. The Bay Trail extension is planned to be opened to the public toward the end of this year. We ask that you remain on the levees and do not descend off the trails into the restoration area. The waters will be in the process of filling the subsided lands and becoming tidal, and we want everyone to be safe as it is finding its place. Sunset is at 6:18pm, so please time your walks so that you will be back to your cars by 6:30 (although you can leave at any time prior to that). The trails are dirt and mostly flat, although there is a slight incline to get up onto the levee. Please wear good walking shoes and bring a sunhat, sunscreen, wind protection, and plenty of water. You may also wish to bring binoculars, cameras, etc. There will be portable restrooms on site. Please leave your pets at home. DIRECTIONS FROM EAST/VALLEJO: (Drive time from Vallejo approx. 20 minutes): Proceed west on Highway 37 past the juncture of Hwy 121 and continue to the stop light at Lakeville Highway. Take a left at the stop light onto Reclamation Road. You will be directed to parking. It's not often that you get to see a landscape really change. And so we're going to change our plans for October 25 from Rosie the Riveter to the levee breach at Sear's Point in Sonoma. We will witness the return of the tides to nearly 1,000 acres that had been sealed off from the Bay for over 100 years. We will explore the project on foot along the future 2.5-mile addition to the San Francisco Bay Trail, and visit the newly-breached levee site to watch the waters rushing through. Native seed packets will be distributed so we can participate in seeding the new tidal marsh. This event is free and open to the public. Pre-registration is required. I'm sorry for the change of plans. But I think this will be worth it. We will go to Rosie the Riveter. I promise. Hope to see you on October 25! What makes a national park anyway? There are actually tons of ways a place can be part of the National Park Service, and they’re all not the kind of park you typically think of. Here’s the thing. There are four national parks in the east bay, but they’re not the Yosemite kind of national parks. They’re sites of historical importance. And they’re taken care of by the National Park Service. Over the next few months we’re exploring the east bay’s national parks because of this. The first one we’re going to go to is the Rosie the Riveter visitor center which is part of the WWII National Home Front Historic Site. All kinds of thing happened there – good, bad, impressive, interesting. The visitor center has films and hands-on exhibits and a gorgeous view of the bay. And it’s free – FREE! – to 4th graders and their friends! Yes! Ride your bike there. Park at Emeryville, Berkeley Marina, Albany Bulb, or Point Isabel and ride north on the Bay Trail. This option is self-guided and self-timed. Walk a mile through the Richmond harbor. We’ll meet at the Barbara and Jay Vincent Park at 10am. The park is at the end of Peninsula Drive in Richmond. Map is here. Meet us at the Rosie the Riveter visitor center at 11am. Driving directions are here. We will explore the visitor center, watch a film, and have lunch at the Lucretia Edwards Shoreline Park, just a bit down the way from the visitor center. Then we’ll go back the way we came, however that was. Bring lunch, water, sun/wind protection, and some curiosity. And if you have a 4th grader, get your free passport.